Gold leaf is gold that has been hammered into thin sheets by gold-beating and is used for gilding. High quality gold is durable. It won’t fade or tarnish. It glimmers in the light and attracts attention from long distances. We use gold leaf gilding for raised and engraved text, borders, and 3-D bas-relief artwork. We occasionally use it for flat backgrounds as well, but due to its cost and the extensive time it takes to apply it , we usually use metallic gold paint (or other colors) for background areas. This also provides more contrast. Gilding is an ancient art of gluing extremely thin sheets of gold onto a curved surface. This is a process that must be done manually by our skilled and experienced artisans. Gold-leaf gilding dates back to Egyptian times 4000 years ago. King Tutankhamen's tomb contained hundreds of wooden artifacts, made in 1400 B.C., that were gold-leaf gilded. 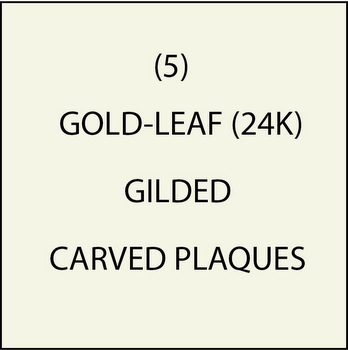 We use 24-karat (100% pure, no alloys) yellow gold leaf to gild plaques & signs. Although sold by the leaf rather than by weight, it costs over $2000 per ounce. Traditional gilding is the most difficult and highly regarded form of gold leafing. It has remained virtually unchanged for several thousand years and is still done by hand. Gold leaf has traditionally been most popular and most common in its use as gilding material for decoration of art (including statues and Eastern Christian icons) or the picture frames that are often used to hold or decorate paintings, mixed media, small objects (including jewelry).Gold leaf is also used in Buddhist art to decorate statues and symbols. Gold leafing can also be seen on domes in religious and public architecture. From the ancient temples in Egypt to modern day buildings, gold leaf has been an integral component of architecture to designate important structures since the dawn of humankind. Gold in architecture became an integral component of Byzantine and Roman churches and basilicas in 400 AD, most notably Basilica di Santa Maria Maggiore in Rome. The basilica's 16th-century coffered ceiling, designed by Giuliano da Sangallo, is said to be gilded with gold that Christopher Columbus presented to Ferdinand and Isabella, before being passed on to the Spanish pope, Alexander VI. Due to gold’s resilience, golden-domed buildings and outdoor signs and plaques can stand up to weather, deterioration and even modern pollution, and they will still be beautiful for generations. By purchasing a sign or plaque that has 24K gold-leaf gilding, you will own a piece of art that has a noble artisan heritage nearly 4000 years old. The gold itself was made inside stars that went supernova, many billions of years ago. To see over 100 metal -coated and gilded plaques & signs, you can go to the Gallery 7 (metal signs & plaques ) page by clicking "Return to List" below right.